SHUTTLE SKY SHOW: Thousands of people who gather in Florida on Monday morning to witness the launch of space shuttle Discovery may get more than they bargained for. Fifteen minutes before the shuttle takes off, the International Space Station will soar over Cape Canaveral, past the gibbous Moon and almost directly above Discovery. How cool is that? Photographers in Florida should be prepared for the ISS flyby at 6:06 am EDT followed by the shuttle launch at 6:21 am EDT. "What a beautiful sight!" says Jens Hackmann. "I took this picture of the pair shining over the Weikersheim observatory dome in southern Germany on April 1st. They were so bright, I could even see them reflected in the rear window of my car." Observing tip: Look before the evening sky fades to black. 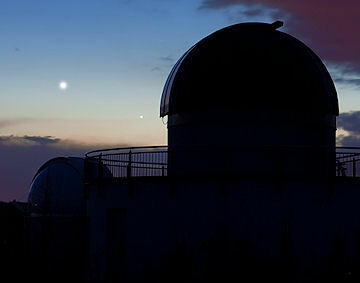 Two bright planets framed by deep twilight blue is a beautiful sight indeed. Sky maps: April 3, 4. "Here in the North, the nights are getting shorter and the midnight sun is just around the corner," notes Broms. 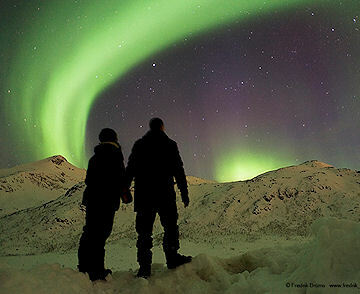 "These could be some of the last auroras we see for a while. If so, it was a very nice way to end a great aurora season." It's nott overr yet, though. The solar wind is expected to blow hard for another 24 hours or so. High-latitude sky watchers should remain alert for Northern Lights. On April 3, 2010 there were 1110 potentially hazardous asteroids.